The 2nd annual Think and Die Thinking indie/punk/DIY festival was held at the Billy DeFrank Center in San Jose, Friday-Sunday August 26th-29th, 2012. The fest’s theme this year was “other”-ness, with a focus on women, people of color, radicals, youth, and the LGBTQ community. Nearly all bands that performed are San Francisco bay area locals, each with at least one member representing an “other”-ed group. For those unfamiliar with the term, to be “other”-ed is to hold an identity which does not fit in with what is accepted as a part of the mainstream. Examples include racial/ethnic minorities, a person whose sexual orientation is any other than “straight”, religious/spiritual minorities, and non-males who work in or support male-dominated areas, including the music scene and many professional fields. To “other” someone else is to act or speak in a way that makes another person feel “other”-ed, i.e., to make them feel different from those surrounding them. The fest included several workshops, including one on what it is to be “other”-ed, where the group discussed their personal experiences of feeling other-ed and other-ing other people, and how to become more aware of the impact that our actions and words have on our community and beyond. Also present at the fest were tables selling (or giving out) DIY zines, art, music, posters, literature, and more. Volunteer staff provided free (or very cheap, $1~$2) vegan food and drinks. A free vegan breakfast and brunch was also given before shows on Saturday and Sunday. 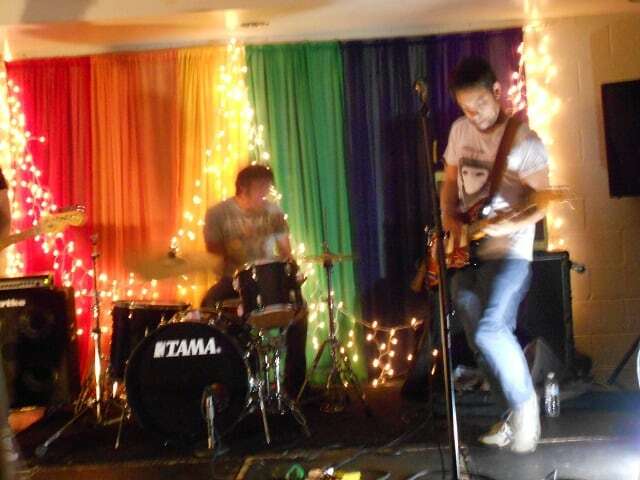 All proceeds from the fest went to support the Billy DeFrank Center for LGBTQ youth and allies. Though we may treat “other”s differently, being “other”-ed does not have to be a necessarily negative experience. Think and Die Thinking celebrates the differences we share as a community, works to encourage acceptance between people of all walks of life, and helps educate so that we are always thinking. The fest is planned to return for Summer 2013!